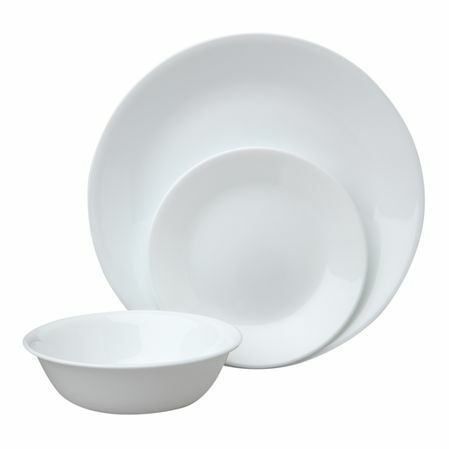 Corelle dinnerware sets are beyond popular. It is often used for everyday dinnerware because of its durability. The dinnerware is actually made of glass but the manufacturing process makes it tough which result in break and chip resistance glass dinnerware. Better yet, the dishes are lightweight, stackable, microwave safe, dishwasher safe, and the patterns are fade resistant. Corelle goes a bit farther than dinnerware sets. 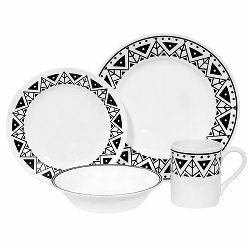 Coordinating tableware, bowl sets, acrylic tumblers, and kitchenware are also available through the Corelle Coordinates line. Practical Bake, Serve and Store bakeware in Corelle brand is perfect for home cooking and for taking to potlucks. The Corelle brand of dinnerware, originally introduced by Corning, has been in production since the 1970s. It is now a brand of WorldKitchen LLC. Over the years many Corelle dinnerware patterns have been introduced. Over time, the most popular pattern is Winter Frost White which was introduced in 1970 and is still in production. Other top selling patterns by Corelle include Country Cottage, Simple Lines, City Block, and Splendor. Corelle makes and has made so many dinnerware patterns. Recently produced pattern segments include Boutique, Contours, Livingware, Impressions, and Vive. These pattern segments offer a great variety of patterns. Corelle square dinnerware is also in production and is quite fabulous. Currently produced patterns are easy to find. You can buy them by sets, and some of them are available individually. Retired patterns can often be found on internet auctions, overstock companies or dinnerware replacement companies. Take a look at an incredible list of Corelle patterns. Corelle is one of the most popular distributors of everyday, casual dinnerware, perhaps even number one! The history of Corelle is pretty amazing. Over the last 40+ years, the brand has passed many milestones and has produced thousands of dinnerware patterns. Learn more about Corelle dishes that grace many tables across the globe. Common misspellings of the Corelle brand include Correll Dinnerware and Corell Dinnerware. No matter how you spell it, this brand is well worth looking into for durable dinnerware that lasts. The brand is well-known for keeping up with trends and producing patterns and shapes that are very contemporary at the time of release. For a vintage look, discontinued dinnerware patterns by Corelle offer a great selection.